Yes, more sweet potatoes. They are such versatile vegetables and work well in both sweet and savory dishes. I am personally a fan of quick breads, especially ones that get most of their sweetness from the main ingredient(s) rather than added sugar. Breads like this make a great afternoon snack when accompanied by a mug of coffee or tea; they are equally as good for a quick breakfast, toasted and spread with butter, peanut butter, or cream cheese. Obviously banana bread is a classic, and you can find my recipe here. But last week I wanted to experiment with a sweet potato-based bread. 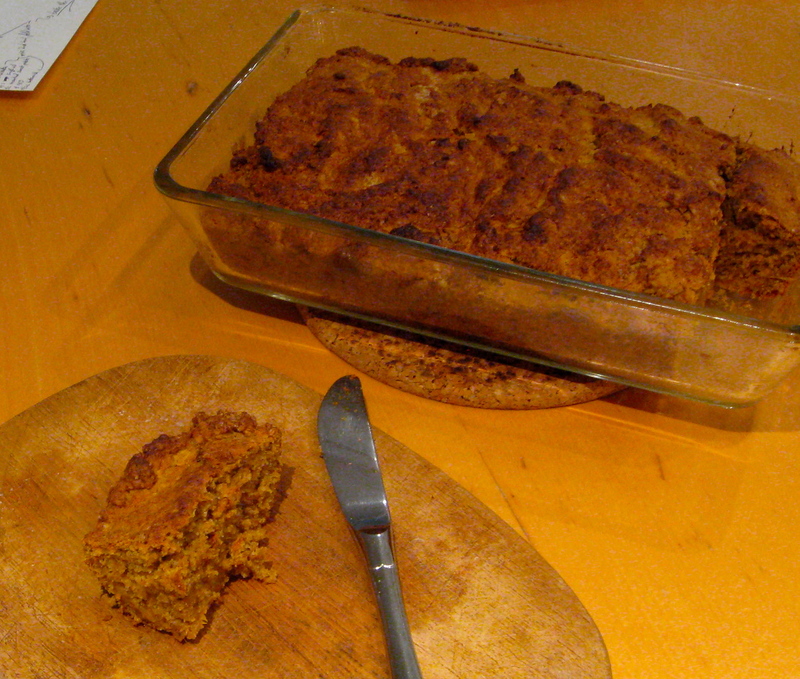 If I can make sweet potato pancakes, I can surely make sweet potato bread, I thought. With a little help from this recipe, I mixed everything up and got the bread in the oven before I even sat down to breakfast. Forty-five minutes later, out came a beautiful loaf: it had a crunchy crust from the whole wheat flour but was deliciously moist and flavorful on the inside. It’s quite healthy, too, with just a bit of brown sugar and a mixture of butter and oil for the fat. If you haven’t already, make the mashed sweet potato: peel and chop 1 sweet potato into chunks. Simmer in water for 15-20 minutes or until the potato is soft enough to mash. Drain, let cool, and mash. Preheat the oven to 350F (175C) and grease a loaf pan. In a large bowl, whisk together the ingredients from flour through salt. In a second bowl, combine the wet ingredients (butter through buttermilk) and stir to combine. Fold the wet ingredients into the dry ones and stir until just combined (the batter will be quite thick). Spread the batter into the loaf pan and bake for 40-45 minutes, until a knife inserted comes out clean. This entry was posted in food, health, pictures, recipes, travel and tagged breakfast, brunch, sweet potatoes on 23.05.2013 by taplatt. Thanks for the link! I’m looking forward to looking on your blog a bit more. I took a trip to Kiev several years ago over Easter and had a great time! Loved the recipe — thanks for the inspiration! If you liked Kyiv and Ukraine, you may enjoy my posts from my two years there — go back far enough and there are fewer recipes and more Ukraine. Happy reading and thanks for stopping by.